Think of your storefront as a three-piece suit. Just as a well-dressed gentleman can convey professionalism at a glance, a business can attract customers through curb appeal. Ask yourself, what is the exterior of your business telling those on the outside? In a world dominated by e-commerce, you have to go the extra mile to give customers a reason to walk through the door. Wondering what ways positive curb appeal could impact you? Here are five big ways your appearance can make an impact. The most important aspect of your building’s appearance is that it communicates what’s inside. An attractive and attention-grabbing sign with a clear logo and important information helps draw in interested parties. Signage lets consumers know exactly where and what you are offering. If someone googles your store but can’t find it when they arrive, you miss an opportunity to make a sale. The experience of brick-and-mortar businesses is one thing that can’t be replaced by online shopping, so why not capitalize on it? Many studies have proven that the atmosphere of a business is a major influence on how people spend their money. A location that is visually appealing, comfortable, and clean creates a positive emotional response and can build brand loyalty. This impression begins from the moment a potential customer lays eyes on your business. If the outside isn’t inviting, people assume the inside is the exact same way. Are you a customer service expert? Show it with your curb appeal! 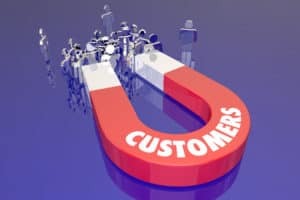 Your product isn’t the only way to attract customers. Convenient parking, clean sidewalks, fresh paint, and attractive landscaping show a potential customer that you take care of every detail. Pride in the appearance of your business creates opportunities for long-term customers. Over 90% of Americans surveyed said that cleanliness was an important factor in determining their repeat business. Don’t let a dirty exterior send the wrong message! Storefront windows are a great opportunity to showcase products and merchandise. 8 out of 10 impulse buys are made at brick-and-mortar stores, which suggests that displays have a powerful effect on our buying decisions. Utilizing your storefront with appealing arrangements and advertising is a great way to convey your brand. Did you know that people are willing to pay more for things largely based on how they feel about them? It’s no secret that the way a product is marketed can change our opinion about how much it is worth. Your storefront is the packaging of your business. A visually appealing package can cause consumers to associate your business with quality products and services. Pressure washing of building exteriors, and more! If your business needs a lift, contact us to discuss your power washing needs.